Here is the list of the hotels near Alligny-Cosne. Book your hotel near Alligny-Cosne today, Friday 10 May for the best price, reservation and cancellation free of charge thanks to our partner Booking.com, leader in on-line hotels reservation. Below here is the list the 50 closest hotels of Alligny-Cosne, sortable according your criteria. You will find the position of these accommodations on the Alligny-Cosne hotels map. A former mil surrounded by nature and bordered by La Cheuille River, Le Petit Moulin offers B&B accommodation with an outdoor swimming pool, terrace and garden. Wi-Fi is free of charge throughout the property. The soundproofed rooms at Le Petit Moulin feature a private entrance, seating area, computer and the private bathrooms are complete with a walk-in shower. Some rooms also have a balcony. A continental breakfast is served daily and a complete summer kitchen including BBQ facilities is at guests’ disposal upon prior request. Le Petit Moulin is 15 km from Briare Train Station and 15 km from Guédelon Castle. Hiking and fishing are possible on site. Free private parking is provided on site. Guest accommodation Lavau Preferred hotel ! Gîte de Lavau is 9 km from the centre of Saint-Fargeau and an 8-minute drive from the A77 motorway. This holiday home offers free WiFi access, air conditioning and a flat-screen TV. With garden views, this holiday home includes a DVD player, a CD player and a radio. The bathroom is fitted with a hairdryer and a shower. A washing machine is provided. Guests can prepare homemade meals at Gîte de Lavau. The kitchen is equipped with a dishwasher, a stove and a microwave. Kitchenware, a fridge and an oven are also provided. Barbecue facilities are at guests’ disposal and packed lunches can be arranged. 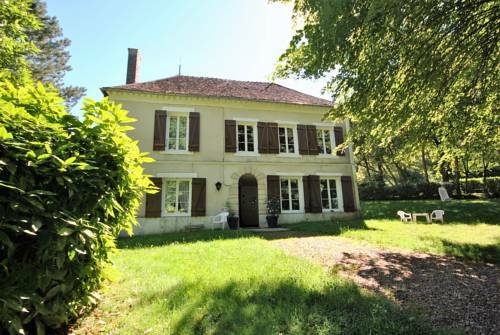 This property is 23 km from Châtillon-sur-Loire. Free private parking is available. There is a garden with a children's playground and baby equipment can be requested on site. Set in 12 acres of lush gardens with a heated outdoor pool, Hôtel les Grands Chênes is a charming, renovated 19th-century manor house. It offers spacious rooms and 5 onsite bungalows. The guestrooms are elegant in style and some are fitted with wooden floors. They come with a private bathroom, a flat-screen TV, tea and coffee making facilities, and free Wi-Fi access. Some of them feature a fireplace and a terrace. Guests can relax in Hôtel les Grands Chênes’s spacious lounge, drink a cup of coffee on the terrace and enjoy walks in the beautiful gardens. Located in the natural region of La Puisaye in Burgundy, the hotel is only 4 km from Saint Fargeau, while Guédelon Castle is 9 km away. Free private parking is available onsite. Set in Saint-Fargeau, Le Hameau des Grilles features accommodation with an outdoor pool and barbecue facilities. Each of the units features a kitchen and a living room with dining area and a flat-screen TV. A microwave is also featured, as well as a coffee machine and a kettle. The holiday home offers a children's playground. Le Hameau des Grilles has a garden and sun terrace. Auxerre is 48 km from the accommodation, while Gien is 47 km from the property. Featuring accommodation with a balcony, Chalet de Moutiers is set in Les Boulmiers. With lake views, this accommodation features a patio. The chalet includes 1 bedroom and a living room with a TV. A fridge and a stovetop can be found in the kitchenette. The chalet offers a barbecue. Auxerre is 44 km from Chalet de Moutiers, while Cosne-Cours-sur-Loire is 37 km from the property. Château de Saint-Fargeau is a 15th-century chateau, located in the town of Saint Fargeau a 40-minute drive from Auxerre. Guests can stay in a suite set in the 18th-century apartments of this historical building. The suite features period décor and antique furniture. There are 2 separate bedrooms and a seating area, all with views of the chateau’s landscaped gardens. The bathroom has a claw-foot bathtub. Free Wi-Fi access is provided. A continental breakfast is served daily and includes freshly squeezed orange juice, French pastries and homemade jams and honey. Guests also have a free visit of the chateau. On specific days throughout July and August, there are also re-enactment shows. L'épicerie is situated in Bonny-sur-Loire. The property, housed in a building dating from 17th century, features free WiFi. This holiday home comes with a kitchen, a seating area, and a flat-screen TV. The holiday home also includes a bathroom. Montargis is 49 km from L'épicerie, while Sancerre is 26 km from the property. Below here is the hotels map of Alligny-Cosne. Names and details of Alligny-Cosne hotels can be shown on the map clicking on the prices icons.